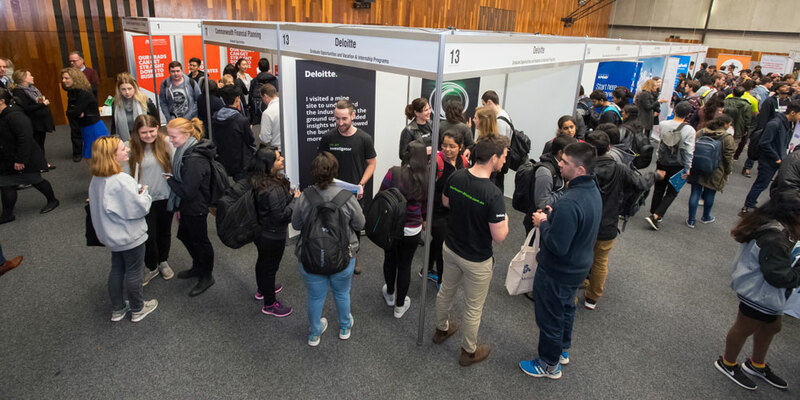 Registrations for the T1 2019 Experience & Employment Expo have now been closed. If you have any queries, please feel free to reach out to the Graduate Recruitment Services team at grad-recruitment@deakin.edu.au. Our EEExpo is held on all three of our campuses which each host a wide range of degrees. To help you choose the best campus for your organisation, see list below or give us a call on 92446002 or email us at grad-recruitment@deakin.edu.au. As always, attendance at our EEExpo is completely free. Why should I supply a video? We would like to use your organisation video to promote your attendance at our EEExpo. This helps students recognise who you are and is a great way to promote your brand. What format should I submit the video in? Ideally a 2-3 minute video via a YouTube link or weblink. However you are welcome to send across an .mp4 video to deakintalent@deakin.edu.au if this suits you better. How do you advertise to your students that we will be there? We send our student cohort emails and reminders about the EEExpo, along with promoting on all our student channels across Deakin. Is there the ability to have electronic visuals? Each booth is provided with a table and has access to electricity power points. However, we do not provide screens in each booth. You are welcome to bring along your own screen, please let us know under ‘Additional Requests’ if this is your intention. How many staff from our team can be at the booth? We recommend at least two so one person can be at the booth at all times. You are welcome to have up to 4 people attend. Do you provide the signage with our organisation’s name? Yes we provide all the signage for your booth. What are the booth dimensions for the standard booth? We aim to have 3m by 3m booths at all campuses if space is permitting. Advertise your employment vacancies for free on the DeakinTALENT Jobs and Internships Board. Contact the DeakinTALENT team about recruiting, raising your brand at Deakin, developing internships or if you are having issues with our Jobs and Internships Board.